The Stone Bridge (Steinerne Brücke) crossing the Danube river, the tower at the southern end of the bridge and the floodlit towers of the cathedral in the background in Regensburg at the blue hour just after sunset. 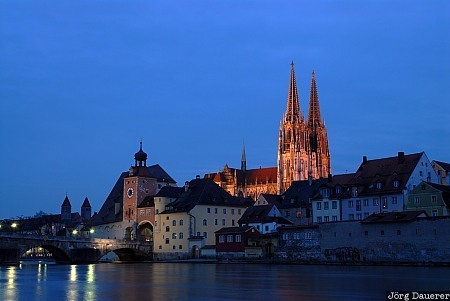 Regensburg is the capital of Upper Palatinate (Oberpfalz) in the east of Bavaria, Germany. This photo was taken in the evening of a cloudy day in April of 2006. This photo was taken with a digital camera.